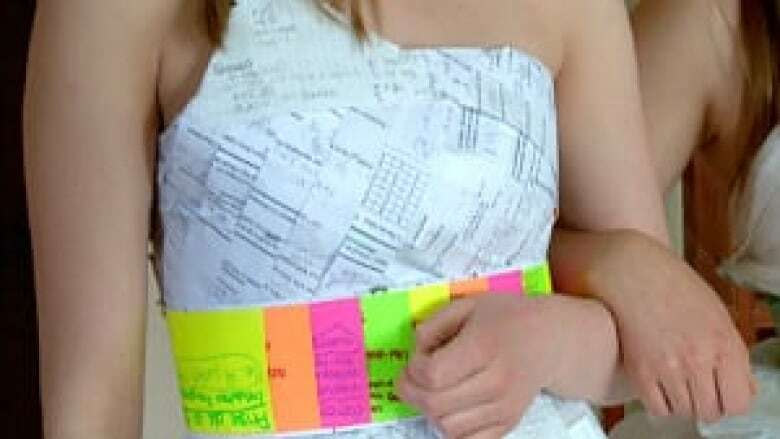 The 17-year-old high school student decided to do something creative for her graduation dress. A dress is one thing a teenage girl can’t stop thinking about months before her graduation, but the only thing Lethbridge student Kara Koskowich could think about recently was her homework. The 17-year-old decided to do something creative for her grad. She opted to make her own dress and use her math homework as the material. "For me, it's not a big, spend your money, you have to look this nice, you have to fit into this mould of grad," Koskowich said. The creative teenager said she thought any dress she could construct would be more interesting – and less expensive -- than the dresses she saw in stores. "It's supposed to look like an explosion," Koskowich said. Koskowich started making the dress in March, but admits she left this particular homework assignment until the last minute. "I finished it the night before grad," she said. "I did most of it in the last week because I’m that kind of person. I procrastinate." The dress was finished in time so that Koskowich could make her grand entrance beside her equally-creative friend, Dorothy Graham, who chose to make her dress out of plastic shopping bags. "It was actually funny because everyone was wearing these elegant dresses and we're in dresses that cost nothing and we were the most popular people there," Graham said. Koskowich used almost 75 pieces of paper to finish the dress.